This week sees the release of another new book devoted to the subject of problem-solving courts. 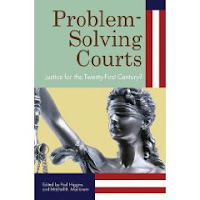 Edited by Paul Higgins and Mitchell Mackinem, Problem-Solving Courts: Justice for the 21st Century? (Praeger) is a collection of essays that detail both the pluses and the minuses of this new approach to jurisprudence. (Full disclosure: I wrote one of the chapters.) The book is another indicator that academia is beginning to take problem-solving justice seriously.